On the side of the World Intellectual Property Organization committee on the protection of traditional knowledge this week, the governor of the Pueblo of Zia explained the case of the sun symbol. An indigenous panel at the committee also provided their thoughts on gaps in the intellectual property system when it comes to protecting their traditional knowledge and folklore. The side event was held yesterday on the margins of the 38th session of the Intergovernmental Committee on Intellectual Property and Genetic Resources, Traditional Knowledge and Folklore (IGC), taking place from 10-14 December. The Governor of the Pueblo of Zia, Anthony Delgarito, explained how the distinctive sun symbol was stolen and later used on the flag of the state of New Mexico, and further on many other items nationally and internationally. The Zia Pueblo is located among the mountains and red earth canyons of northern New Mexico, about 40 miles northwest of Albuquerque. Pueblos were names given to the tribes by colonisers, Delgarito said, first by the Spanish, and later by the Mexican. The state of New Mexico hosts 19 pueblos, he said. The Zia logo is used by the state of New Mexico on both the flag and license plates. However, the sun symbol is an “exceptionally significant religious symbol,” he explained, and existed since time immemorial, well before the US was founded. “It represents the tribe itself,” he said. Archaeological evidence shows that the symbol has been in existence for several hundred years, he added. According to Delgarito, in 1923, the state of New Mexico, which at that time did not have a flag, launched a contest for a flag design. As it happened, an anthropologist named James Stevenson in the late 1890s built a trusted relationship with the Zia, and was allowed to attend their sacred ceremonies, Delgarito said. Stevenson stole a piece of pottery with the sun symbol which was later displayed in New Mexico’s capital, Santa Fe. Another anthropologist living in Santa Fe, Harry Mera, was inspired by the sun symbol on display at the museum, entered the contest with his wife using the sun symbol, and won the flag contest. 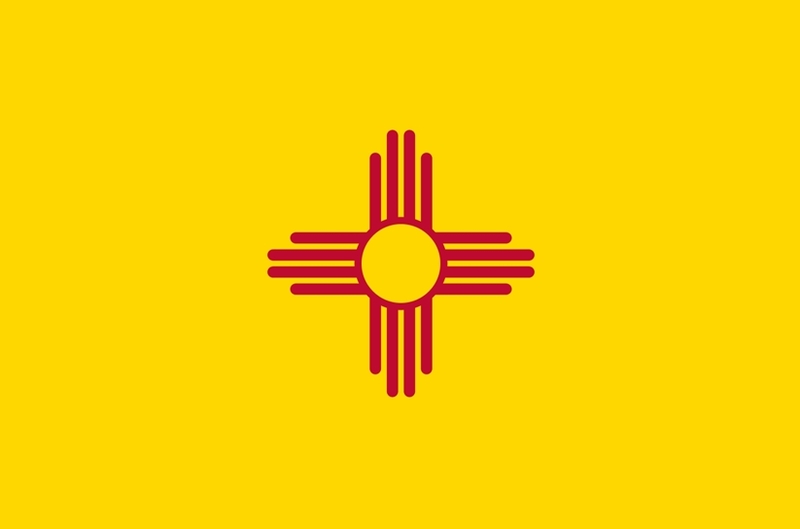 In 1925, the design was officially adopted as the New Mexico state flag. The Zia sun symbol was appropriated without the consent of the Zia, Delgarito stated. It later became part of the public domain, still without consent from the Zia. The symbol was stolen from the Zia secret society, he said, all the more significant since the symbol was used in religious healing and wellness processes. The Zia sun symbol represent the four cardinal directions, the four seasons of the year, the four period of each day (morning, noon, evening, and night), and the four seasons of life (childhood, youth, middle age, and old age). The centre of the sun symbol stands for life itself, Delgarito explained. The general public is using the Zia sun symbol without knowing its history or the religious significance behind it, he said. Zia at least want respect for the symbol and that it is not desecrated. The taking of the symbol was the taking of Zia’s identity, he said, which continues to be threatened by ongoing exploitation of the symbol. The Zia want the general public to ask permission to use the symbol, and to contribute to a scholarship programme fund so that children have the opportunity for a sound education, he said. The Zia have no control over how the symbol is used, he said, giving examples of desecration of the symbol: tattoos, gravestones, the embedding in the floor of the New Mexico State Capitol, and marketing, he said. The Zia have learned from their misfortune with the sun symbol and now close their village during secret ceremonies, he remarked. 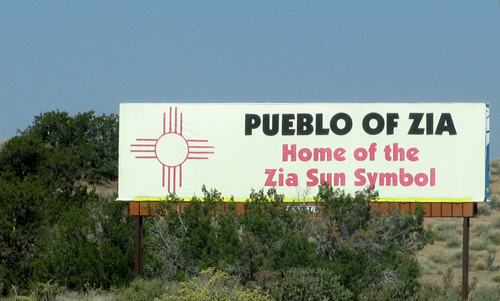 The Zia are trying to raise awareness among the New Mexican government and the general public about the significance of the sun symbol and the importance of not defaming it. The Zia now have a protocol to follow if someone wants to use the sun symbol, he said. As an example of use the Zia have agreed to is on the Southwest Airlines planes. There is little the Zia can do about protecting their sun symbol, as it has been considered in the public domain for a number of years, said a speaker in a video shown during the side event. A panel of indigenous peoples at the IGC yesterday gave perspectives on gaps in the IP protection of traditional knowledge and traditional cultural expressions of indigenous peoples. The three panellists mentioned the importance of the United Nations Declarations on the Rights of Indigenous Peoples [pdf], and in particular Article 31, which asserts the right of indigenous peoples to maintain, control, protect and develop their cultural heritage, TK and TCEs, and the right to maintain, control, protect and develop their intellectual property over their cultural heritage, TK, and TCEs. Commenting on the Zia case, June Lorenzo, a lawyer advocating in tribal and domestic courts and legislative and international human rights bodies, said in the late 1890s, Zia was at a very vulnerable point, as many other tribes were. A number of archaeologists came and took “what they could because they thought we were going to disappear as a civilisation,” she said, noting that the stolen pot was repatriated in 2000 or 2002. In the 1990s, the Zia began to organise and demand compensation, and then they challenged trademark applications, she explained. In one case, they only prevailed because of public outcry and the company withdrew its application, she added. According to Lorenzo, the idea of the public domain often times is contrary to what indigenous peoples think. Elifuraha Laltaika, expert member of the UN Permanent Forum on the Rights of Indigenous Peoples, and executive director for Law and Advocacy for Pastoralists in Tanzania, remarked that TK cannot be separated from indigenous peoples’ lives. He stressed the importance of free prior informed consent of indigenous peoples and said it should be the central theme of any agreement to be reached. He also underlined the importance of benefit sharing, and the full and effective participation of indigenous peoples in the decision-making process, particularly when decisions will impact their lives, with far-reaching consequences. Q”apaj Conde Choque, an Aymar lawyer from Bolivia, said indigenous peoples want to have control over their TK but gaps in the law make it difficult to exercise that control. TK, for example, cannot answer to the patentability criteria of novelty and industrial application, he said. Indigenous peoples are also creators and innovators, and those inventions could meet the patent or copyright requirement, he said, but the collective authorities holding that knowledge do not access the IP system, because they do not feel that the protection by the current system fully satisfies Article 31 of the UN Declaration on the Rights of Indigenous Peoples. In the audience, Preston Hardison, legal advisor for the Tulalip Tribe, commented on the “tiered approach” being considered in the draft articles discussed this week at the IGC. The tiered approach would differentiate the level of protection according to whether the knowledge is secret, sacred, narrowly diffused, or widely diffused. The tiered approach would not answer cases like the Zia sun symbol, which illustrates a violation of fundamental indigenous laws, he said. According to Hardison, some indigenous peoples seek the recovery of some of their TK and TCEs because the “violations are so bad,” so fundamental to who they are as people, that they need to recover the control over their TK and TCEs. “That’s not really what we are doing in the tiered approach,” he said. It should be noted that during the indigenous panel, a number of delegates left the plenary room, leaving the indigenous peoples to speak to a depleted audience. "Indigenous Knowledge Misappropriation: The Case Of The Zia Sun Symbol Explained At WIPO" by Intellectual Property Watch is licensed under a Creative Commons Attribution-NonCommercial-ShareAlike 4.0 International License. Interesting. I’m working on a book about state symbols – Geobop’s State Symbols – which includes a series of report cards. New Mexico is tentatively the only state besides Hawaii that gets an A, aided by its beautiful flag. My book is very political, and I certainly want to mention the issues raised in this article. I wonder if it would be helpful to encourage people who use the Zia symbol to make voluntary payments to some kind of Zia trust? Even a few token payments might send out some sort of message.